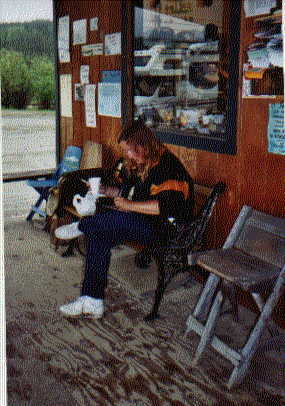 6/15/00 Photo above is of me drinking coffee & writing post cards in Chicken, Alaska located on a dirt road called "Top of the World Highway". It was raining buckets! The road & bridge washed out later that day. I got out just in time or I would have had to pitch my tent in the rain. Between 4/8/00 and 7/9/00 I drove 21,000 miles alone in my Kia Sephia. It was a journey that I will never forget, and a journey that begs to be shared! Traveling alone in my car gave me the freedom and opportunity to explore places where I had never been, meet people who I would otherwise never have met, and most of all to gain the knowledge that I did indeed have the inner strength and perserverance to accomplish this enomous undertaking on my own! The idea of driving across the US first struck me in February 2000. February 8th to be exact. I'm not sure what the catalyst was...but on that day I made the decision to actually do it. I had toyed with the idea a couple of times in the past--thinking that "someday" I'm going to drive across the country. Someday. But in the back of my mind I never thought that I'd really be able to do it. I was going on 46 years old, and "someday" had never come--and it looked as though "someday" would never come. I'd known friends & relatives my age, younger & older who were ill or who had suddenly "passed away". Life is short and you never know when your number is up. "Someday" would never come unless I took steps to make it a reality. I didn't want to look back "someday" and say, "Gee, I wish I had made that road trip across country." There are a few things in my past that I wish I could change, but that's impossible. And I'm sure there will be things in my future that I have no control over, but I can do something about "now". It's now or maybe never--I'm goin' for it !!!! That realization spurred me to make the commitment to actually do it--it was now or never! 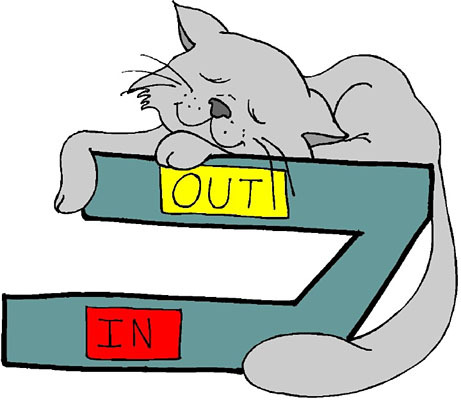 And so I set the date of my departure--April 8th. That would give me 2 months to prepare and to do research for the trip. And planning was just as interesting and fun as the actual trip! Originally, I thought about driving from the Atlantic to the Pacific--straight across the country--about 3,000 miles each way. Not bad. But then I started thinking about places I wanted to visit, like Key West, Florida. 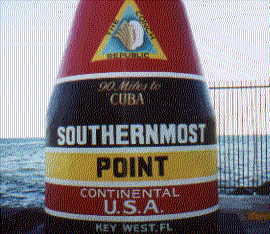 But Key West was so far south--that would take me a couple thousand miles out of my way. I had to make some decisions. Where did I really want to go? What did I really want to see? And how far was I willing to go? There would be a lot of factors to take into consideration, like mileage and the cost of gas, the cost of food, where could I afford to stay (finances would be extremely tight), and how long would this trip take? I also had to be realistic about the possible dangers of driving such a long distance alone. I started scouring the Internet & studying atlasses researching each state that I would be crossing--looking for points of interest, noting weather conditions, even checking out plant & animal life. I was especially interested in learning all I could about the deserts of the Southwest. Since I would be setting up my tent in those areas it would be nice to know what "critters" might be crawling around outside (hopefully outside) my tent at night. The next step in planning was to buy a large 4' x 5' map of the continental United States, and tack it up on the wall in my hallway. 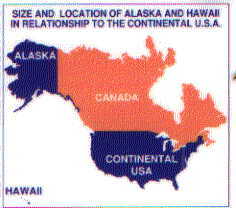 Looking back, I realize that I should have bought a map showing the whole of North America, but at the time I had no idea that I would later extend my journey to include British Columbia, the Yukon, and Alaska! Wow! What a big country! I mean, I always knew that it was a big country--but seeing the map there in front of me, and knowing that I was going to drive across the entire expanse before me, made it seem all the bigger. This trip was going to be fantastic! My Travel Notebook was an important addition to my planning stratagy. It started out as a 3 ringed binder filled only with clear plastic sleeves. As I continued my quest for information on the Internet, I printed out any & all interesting and pertinent information such as State & Federal Parks, campgrounds, seasonal weather conditions, flora & fauna, mileages between majoy cities, etc., and compiled it into my travel notebook. Every day of research was a day of discovery--there are so many interesting places to see all over the country! And I wanted to fit in as many as I could. More "stuff" on planning...hey, I can't help it, I'm a stickler for details! I found a couple of small, out-dated (cheap) US road atlasses. They were perfect because each little page contained a map of an entire state. I tore out the pages, and with a black magic marker plotted my "tentative" travel route through each of the states. Then I slipped each completed map page into a clear plastic sleeve in my travel notebook in it's appropriate place. Finally in front of the notebook I placed a small map of the US with my entire "tentative" route clearly marked. I say "tentative" because the purpose of the notebook was to give me a basic guide to follow, a safety net of sorts to "ground" me should I get halfway across the country and start to freak out! The idea of driving so far alone away from home, having never done it before, can be unnerving at times. I thought it best to at least try to be prepared for just about anything. My roughly mapped route was also tentative because I knew that I would be taking a few unscheduled 'side trips' along the way. If I saw a sign pointing to someplace that sounded interesting--I went there. I wanted my plans to be flexible. An example of an unplanned side trip was my visit to Los Alamos. 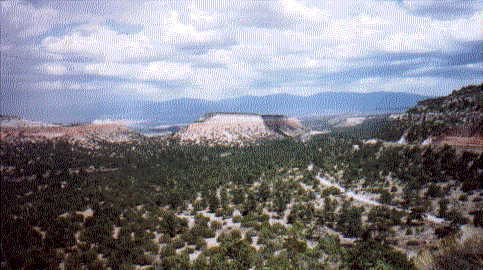 After leaving Santa Fe on my way to Taos, I saw a highway sign for Los Alamos--it was only 50 miles or so out of my way, and I knew I'd never get a chance to go there again--so I went. On my way I could see smoke rising from that direction. I remember thinking, "With my luck Los Alamos is on fire." Well, unfortunately I was right. More about that later. Back to the Travel Notebook: It often came in handy because most of the information that I needed was always right there beside me in one place--nice and neat and organized. Not like the rest of the stuff in the car...After 5 or 6 thousand miles of driving, my car was getting pretty messy with numerous scattered pamphlets, literature, big, half crumpled up road maps, etc..(ok, I admit it, I am a slob most of the time.) But at least the notebook remained almost fully intact during the entire trip and was always there when I desparately needed it. Of course, in addition to the small state maps in my notebook, I also had a couple large up-to-date road atlasses (with metal, spiral binders--so they are easy to open) and about 35 full sized state maps that I had ordered from my Shell Motorist Club. I've been a member of that club for years, but never traveled so I never had the opportunity to use their services. It was about time that I finally got something back from all those years of membership fees! Plus, during the trip, whenever I entered a new state I tried to make sure to stop at the "Visitors Center" to rest and get their free maps and information. You can never have too many maps. They are all a little bit different. One thing to keep in mind when traveling is that most Visitor's Centers close early, around 4 or 5 pm. And most don't open until 8 or 9 am.. I learned it's always wise to stop in the centers for information everytime you enter a new state. You don't want to miss anything! Click here to Return to the Home Page & Start Traveling!